TE Studio design beautiful, durable, earth-friendly Passive House buildings that provide healthy environments and economy to meet your needs—both now and in the future. Tim Delhey Eian founded TE Studio in 2008 in response to a building design industry that traditionally focuses on design and not performance. At TE Studio, we feel that it is important to create buildings that blend and maximize both. We practice Passive House design. Passive House is a rigorous, voluntary building energy standard focusing on highest energy efficiency and quality of life at low operating cost. It originated in Germany. However, the founders of Passive House were deeply inspired by the energy conservation movement in the U.S. in the 1970s—spurred by the energy crises. In our opinion, bringing Passive House to the U.S. means coming full circle. We adopted this world-class standard as soon as it was commercially available in the U.S. to provide you with measurable, leading edge performance. We are a full-service building design firm, offering all phases of residential design from the first schematic sketches, through building certification. We provide certified Passive House™ consulting and design services, combining architecture and engineering to deliver a unique blend of performance and design. We work with you to maximize your investment while minimizing its impact on the environment. 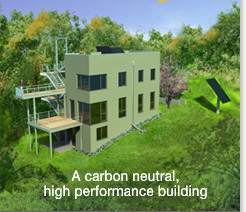 TE Studio specialize in Passive House design for new construction and retrofit projects. At TE Studio we pride ourselves in collaboration, not only with our clients, but also with cutting edge specialists in the building industry. We firmly believe in an integrated design approach—always looking at all aspects of a project. We maximize its potential through integration of design, assemblies, equipment, and controls. We partner with expert consultants and builders to guarantee the highest level of performance and design in the built product. Leading edge design and engineering is in our DNA. It is what we pride ourselves in. Our clients value a unique offering based on sound engineering and cutting edge technology, blended with modern designs and robust material choices. Our unique background enables us to integrate expertise from both sides of the Atlantic. We are fluent in German and English—in building design and building science. We blend decades of Passive House design with the experience of design and construction in our extreme Midwest climate.